Oven Baked Chicken Thighs are juicy, tender and full of flavor. With a few tips and some simple ingredients, these never-dry chicken thighs can be easily made at home with restaurant quality! These Baked Chicken Thighs are out-of-this-world delicious with the perfect balance of savory and sweet flavors. 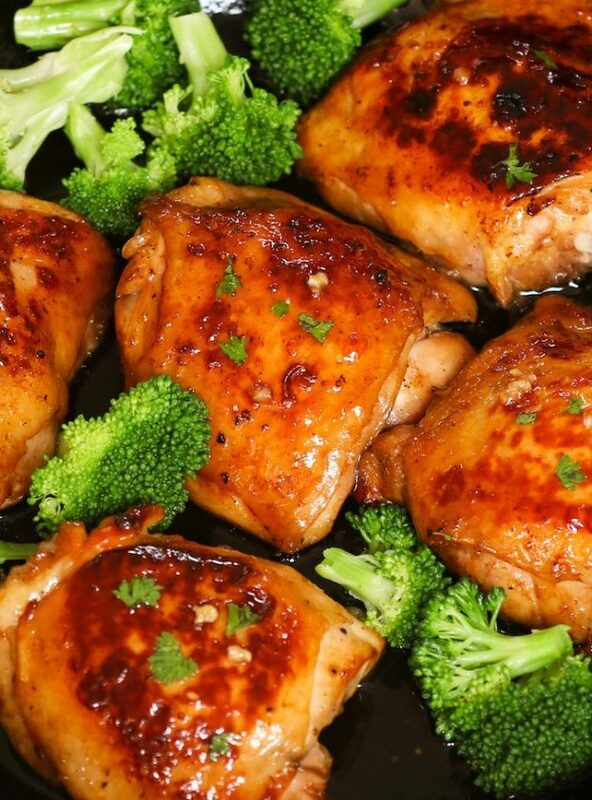 If you like our Teriyaki Chicken and Crock Pot Chicken, you will definitely love this recipe! While I love chicken breasts in recipes like Bacon Wrapped Chicken and Chicken with Potatoes & Green Beans, I firmly believe that dark meat is more flavorful and moister than white meat. Chicken thighs are also easy to prepare, especially when you bake them on a sheet pan, making clean-up a breeze as well. If you use bone-in and skin-on chicken thighs, you will need to bake them at 400°F for 35 to 40 minutes until the internal temperature reaches 165°F. Baking them at a high temperature for a shorter time is one of the secrets to extra tender and juicy chicken. If you use boneless/skinless chicken thighs, bake them at the same temperate for 25 to 30 minutes. Marinating your chicken thighs for 30 minutes (or up to 8 hours) will make them extra tender and juicy. Even marinating for 15 minutes will make a huge difference when you are in a rush. Bone-in and skin-on chicken thighs work best for this recipe as the bone adds more flavor and keeps the thighs tender. The marinating process is the secret to extra tender and juicy chicken. Don’t skip this process. Always marinate your meat in the refrigerator. It’s best to take your marinated chicken out of the refrigerator for 20 minutes before cooking, and let them come to room temperature. Use a rimmed baking sheet as the chicken will produce some juices during the baking process. A meat thermometer is important to make sure the internal temperature reads 165°F (74°C). Make sure to let your chicken thighs rest for 5 to 10 minutes after they are baked. You can add broccoli for the last 15 minutes if you’d like to add some vegetables to your meal. These chicken thighs are great with potatoes, rice, pasta and vegetables. You can also use them in salad or sandwiches. If you have leftovers, store them in the fridge, here are some details about how long you can store cooked chicken in the fridge. A sheet pan or roasting pan is ideal for this baked chicken thighs. To test doneness, an instant meat thermometer is extremely helpful. Just insert the tip of the probe into the center of the chicken and check it reads the safe temperature of 165°F. Oven Baked Chicken Thighs are juicy, tender and full of flavor. 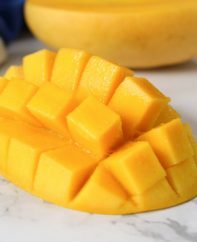 They are out-of-this-world delicious with the perfect balance between savory and sweet flavors. In a large bowl, season chicken thighs with salt and pepper. Then set aside. In a medium bowl, mix together soy sauce, vinegar, sugar, garlic and water. 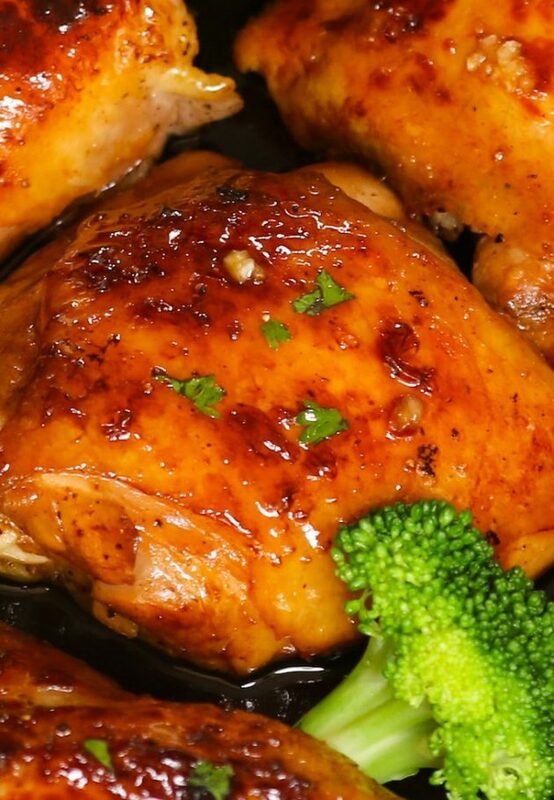 Pour the sauce mixture over the chicken, or optionally marinate the chicken for 30 minutes up to 8 hours in the fridge. 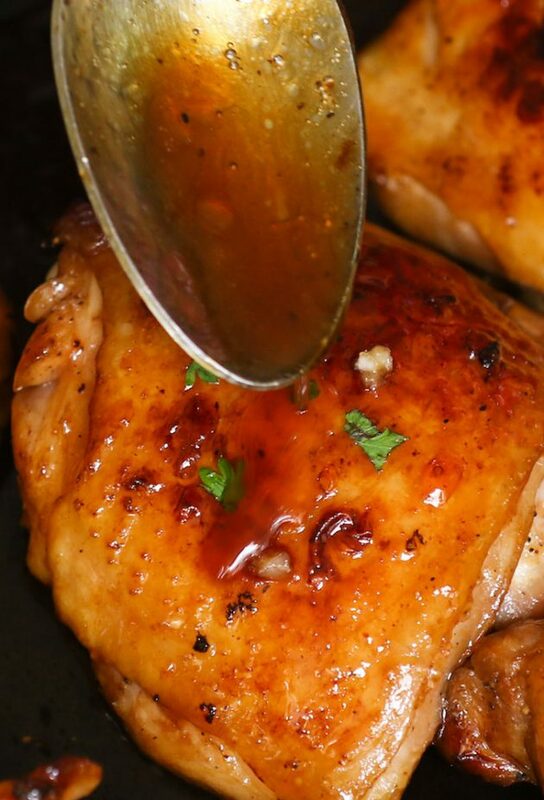 Remove chicken thighs from the sauce and allow any excess to drip off. Then arrange on a baking sheet. Bake for 35-40 minutes until the internal temperature reaches 165°F. Remove from the oven and let the chicken rest for 5-10 minutes before serving. Cover with aluminum foil or parchment during this time. Serve over rice, pasta, or potatoes with vegetables. Garnish with minced parsley and/or a sprinkle of paprika if desired. This looks great! I know I’m supposed to let the chicken rest, but it’s so hard not to start eating right away! Thanks for sharing. I thought you ALWAYS Discarded the left over marinade to avoid contaminating the foods ??? Taste great. Though I didn’t understand pouring 1/4 of mixture over chicken. Where does the remaining 3/4 go? An excellent dinner recipe my whole family will love! 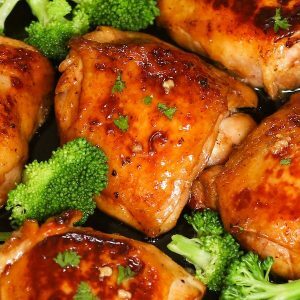 These Chicken thighs looks so incredibly juicy and delicious! 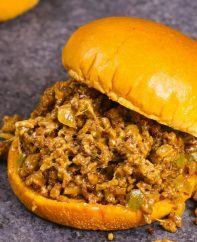 I will have to put this recipe on my menu for this week! Do you cook the chicken in the marinade? Is it OK to use Apple cider vinegar instead of white vinegar? This recipe was amazing. Seriously so simple and yet so flavorful. It was a big hit with my dinner guests, that later asked for the recipe. I followed the recipe with the addition of crushed red pepper flakes and onion slices to the marinade. Do you cook the chicken in the marinade if it was marinated for 8 hours? I baked this chicken for my family minus the broccoli because I don’t know if it’s in season or not but what I saw at my grocery store was not good. I finish the dinner off with rice mix with cream of mushroom soup and a pasta fresh vegetable salad and my two-year-old went crazy over it and my husband loved it and my mother loved it and I loved it thanks for Sharing!